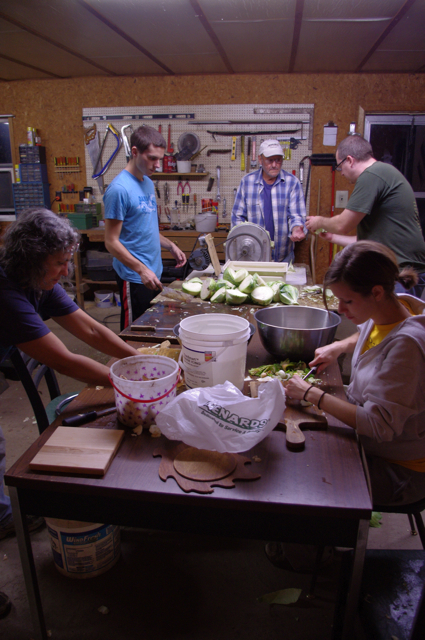 Making Sauerkraut at the Meyer Farm! A cloth sleeve made from a bed sheet to fit the crock with extra height to tie a knot on top. For every 8 lbs of sliced cabbage, add 1 sliced onion and 1 sliced pepper. Put 4 lbs into the bottom of the crock (inside the sleeve) and then sprinkle 1/6 cup of salt over it evenly. Add the other 4 lbs and sprinkle another 1/6 cup of salt. 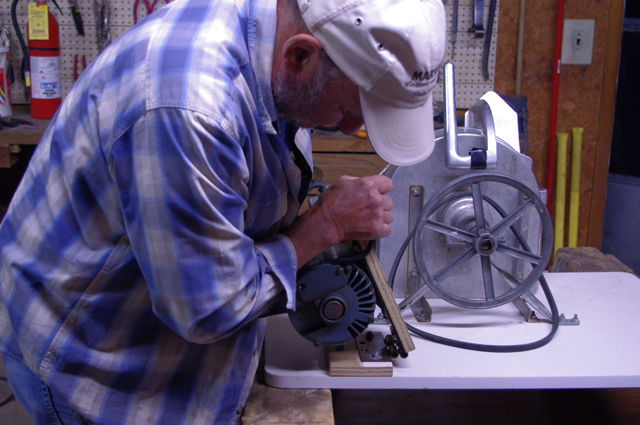 Then pound it with the tamper, working around the edges through the mass evenly. We had someone pounding the whole time as others cut up the cabbage and onions and peppers. After there is several batches of kraut in the crock it will start to weep water/juice. You need to create enough of this liquid by pounding for the liquid to cover the cabbage mixture when finished by at least an inch. <Here is my grandpa pounding the cabbage down (at gunpoint). And here is our friend Red and her son Marcel> taking a turn! Here’s our hardy crew. Pa Meyer is in the garden getting more cabbages. When the crock was full, and we had pounded plenty of liquid out of the cabbage, we twisted the sleeve tightly into a knot at the top of the cabbage mixture. 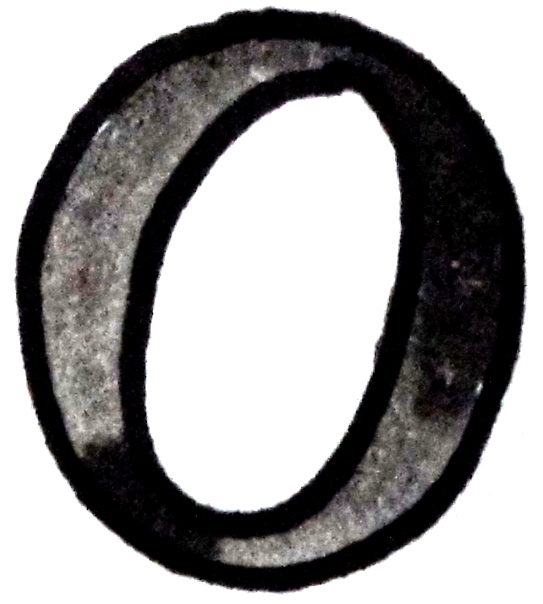 Next we placed my grandpa’s special rock-a flat donut shaped piece of granite, which he called “The Holy Stone”, on top of the sleeve. He had someone at the granite yard cut it for him 1 and 1/2 inch thick with a big hole in the middle. This secured the knot and weighed down the sleeve and it’s contents, so that the liquid level was above the stone. Lastly, a clean dish towel was placed over the top of crock, and on top of that, a tightly fitting wooden lid my grandpa made for the crock. Take care that the towel which is there to keep flies and insects out, does not sag down into the kraut liquid, or it will wick it out of the crock. The kraut will make scum on the surface of the liquid. Once a week my grandpa checked on it and scraped the scum off the top. Make sure the cabbage stays below the level of the liquid. After 4 or 5 weeks, if it stops scumming, give it a taste. You can give it a few more weeks depending on how sour you like it. My grandpa always adds the onions and peppers which he says sweetens the sauerkraut up, then it’s “Bavarian Sauerkraut” . Straight cabbage is too sharp for him. Some people make it straight and then cook it to serve it with butter and sugar. My Grandpa says his is delicious uncooked. We can the sauerkraut when it is finished. My grandpa says in the old days before cellars had furnaces in them, the crock was moved to a cool corner and the kraut taken right out of it to be eaten. After a few years the cabbage would be dark grey in color but still edible! You can weigh the cabbage down with a board and a big stone on top of the board but the cabbage by the board will discolor. <Check out my Mom’s headlamp for hunting wild cabbages! And lastly a little diagram and drawing of the underside of the wooden lid my grandpa made to fit the crock with the towel. If anything is unclear or you have any further questions, just ask! Happy fermenting! 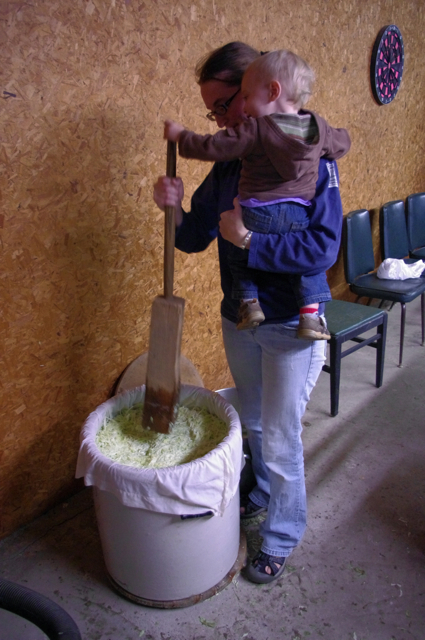 2 Responses to Making Sauerkraut at the Meyer Farm! 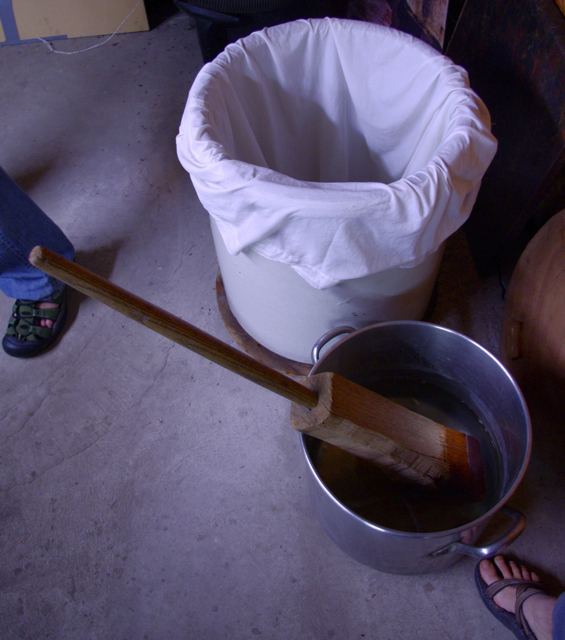 Sorry, we don’t sell sauerkrauts, we are just old-fashioned Germans making sauerkraut for our root cellar.